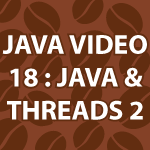 In this Java Video Tutorial, I continue to teach you about Java Threads. If you missed the last part, watch it first here last Java Tutorial. Today I cover how to lock down methods, synchronized, thread pools, scheduleAtFixedRate and numerous other Java Thread methods. Use the code that follows the video to make it easier to follow this tutorial. It is heavily commented and will help you. // Quiz: Why does it say there are 4 threads when we expect 3? // sure only one thread at a time can execute it. // be used when necessary. Please put the codes of Java Video Tutorial 18 on this page. Hi, great videos! Just wondering about why the TimeUnit library has to be static? Line 3 in JavaLessonEighteen. Ok, thank you for quick answer! And the tutorials are just great, have been through 1-24 now and my understanding of Java Programming is so much better than after all the other java tutorials I’ve tried out! Thank you. I’m very happy to hear that. I always wonder who my competition is. I don’t watch any other tutorials so I don’t know what I’m up against. There are alot of other talented guys making tutorials on Java, but your pace suits me very well. The others are often a bit slow. Also the fact that you edit your tutorials is as far as I can tell very rare but very nice for us viewers! Just put static to java.util.concurrent.TimeUnit. *; I used to have the same error. Derek instead of library here i used TIMEUNIT.SECONDS directly as argument so i got perfect result. So this pretty much explains the concept of multi threading? Or is that something else? I would think multi-threading involves running the threads at the same time not scheduled threads. Hi, your video tutorials are awesome!! Thank you for this great vidoes. I have a question. Why we used try block in addThreadToPool() method? That is there to solve issues that an interrupt may cause. Is there a limit to how many threads can be started? Is there any type of architecture dependency for threads, like does it have to be multi-CPU etc for the threads to run simultaneously? The JVM has an upper limit to the number of threads, but it is in the 10s of thousands. For each new thread you create you will take a performance hit.